This refrigerator starts out as a block of wood, just about anything will do. I think I used pine 2 x 4's. For the body cut a piece 5" tall x 1 7/8" deep x 2 3/8" wide. If you have to stack and glue to get your size that's all right. If you have an old refrigerator to copy and measure, that's great, use it. Refrigerators will vary a little on measurements. I know the old ones were smaller than today's refrigerators. The door is 3 5/16" tall x 2 3/8" wide and 1/4" thick. I used basswood. The drawer is 1 1/4" tall x 2 3/8" wide and 1/4" thick. I used basswood. The bottom grille is 3/8" tall x 2 3/8" wide and 3/16" thick. I used basswood. You will need some basswood 1/32" thick for the gasket and bottom and 1/16" thick for the back grille. Once you have gotten all of your pieces cut to size make a pattern to use for the top of the body. If you have access to a band saw or scroll saw use it to round off the corners on the top of the refrigerator. If not get some 100 grit sandpaper and sand the corners off. Soften the front and back edges just a bit. Don't keep them sharp. **Important** Please dry fit your pieces to your pattern to keep the rounding off from going to far. Dry fit your pieces together while you are sanding to make sure they will fit . You want a space between the door and drawer about card stock thickness. A little more between the drawer and bottom grille. The bottom grille should be even with the bottom of the body. Adjust your pieces now before the painting and gluing. After you are happy with the body match the door to it. With sand paper, maybe 220 grit, round the face of the door. Soften the edge that will be towards the body, leave the outside and inside bottoms alone. Keep these sharp. Go onto the drawer. Keep the inside and outside bottom and the top edges sharp. Round the face to the sides just as you did with the door. I copied a refrigerator that had a round center pull on the drawer. I used my Dremel to cut into the basswood. I used an engraver cutter. Unfortunately, I couldn't undercut the center circle enough. When trying I just kept making the center smaller and I thought I should stop while I was ahead. Thinking about it now I should have taken the center out and replaced it with a dowel that had a small circle glued to it. You can do either. The bottom grille is sanded just like the drawer. I glued on 3 pieces of half round to make it look like a grille. You can make half round from 1/16" x 1/16" basswood strips, sand 2 corners round on one side. Glue these evenly spaced onto the front of the grille. Round them off towards the sides. Use Rustoleum white and black for the painting. The grille will be painted black, the rest is white. Give everything 2 coats, let the paint dry between coats. Now sand, using 220 grit. The body is going to take longer if you used pine or even if you stacked basswood. You will have to paint and sand to cover the grain and where the pieces were glued together. We are painting a couple of coats then sanding to a smooth finish. It will take a few days to do this. As you start getting a smooth finish start using a finer grit sandpaper, up to 300 or 400 grit. You are after a smooth porcelain appliance finish. You stop when you are satisfied, do not sand the final coat. While you are painting and sanding you can make the back grille, gasket, and bottom. Trace around the back of the body onto card stock. Measure in 3/32" to 1/18" around to top and sides. Cut out and place onto back of body. If you need to change the size do it now, you should have not more that 1/18" of the body showing. When you like the size, trace onto 1/16" thick basswood and cut out. Remember to cut on the line or your piece will be bigger than you expect. Dry fit this, if it's the right size paint it black. Trace around the bottom of the body onto card stock. This piece's edges are even the the body. Trace onto 1/32" thick basswood. Dry fit and trim if needed. Paint black. Trace around the door onto card stock. 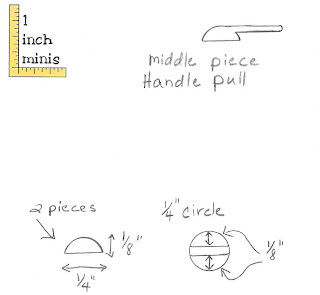 Measure in a 1/16" around the top and sides. Cut out and place against the door. We want this gasket to be just inside the door, not too far in, enough to see that it's just a bit smaller. When you are happy with that, trace onto 1/32" thick basswood and cut out. Dry fit, make changes if needed. Mix your Rustoleum white and black to make grey and paint the gasket. I used Testor's silver enamel to paint a line on the bottom of door and top of drawer, around the circle and the knob of the drawer. I used masking tape to do the lines. I use wood glue to glue the parts together. Glue the bottom onto body, keep the edges even. Glue the back grille onto back of body. Make sure you have an even margin of body showing on sides and top. Glue gasket onto front of body. Keep an even margin of body showing around top and sides. Glue on door, drawer and bottom grille. The bottom grille is even the the body, not the bottom piece you glued on. For the handle I used 1/16" thick basswood. I traced a circle 1/4" round. I cut this in two so each piece was 1/4" x 1/8". The next piece is 7/8" long from 1/16" thick basswood. One end is cut just like the 2 other pieces (1/4" x 1/8") to fit between them. The other end is long and straight for the handle pull. I have a diagram at the top of the page. Glue these 3 pieces together. Sand round the end of the handle pull tip. Paint this silver. You will have to do this a few times with a little sanding between coats to get a smooth aluminum finish. I used super glue to attach the handle, be careful. If you have any questions about this project, please e-mail me and I will be glad to help you. This is how I made the kitchen sink for the kitchen room box. I made the sink from wood, gesso and a jelly container, the small single serve kind from restaurants. If that's not available I've used any "bubble" packaging that is the size of the sink I want, this one being 1 1/2" x 1 3/4". Start out with a piece of 1/16" thick stock, 1 7/8" x 4 1/2". Cut a hole in the center for your sink. I am now going to refer to this piece as the sink top. The plastic bubble should have a flange that you can use to glue the "sink" onto the wood. I glue the "sink" under the top. Don't glue now, just don't trim this flange off. Measure the sink and cut the opening, 3/8" from the back and 1/8" from the front. You can use an exacto knife, cutting a little bit at a time. Sand smooth. We are going to add onto the 1/16" x 4 1/2" x 1 7/8"piece, the sink top, by gluing more wood to the top of it to make it thicker for the edge, back of top and drain board ridges. From 3/32" stock cut a strip 3/8 wide and 4 1/2" long. Soften one edge of this piece, it should not be square, diagram A. This piece is glued toward the back on the of the sink top. This is where the faucet will be glued on. Glue the strip on using wood glue and clamp. From 3/32" stock cut a strip 1/8" wide and 4 1/2" long, also cut 2 strips 1/8" wide and 1 3/4" long. 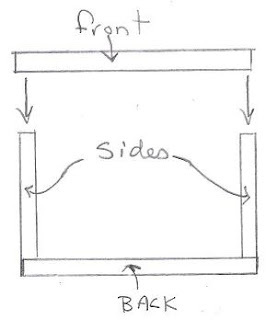 Soften the top 2 edges of these 3 pieces, diagram B. Glue these pieces onto the sink top according to diagram C. Clamp and let dry. When dry slightly round off the front 2 corners of the sink top. When everything is dry I sanded a slight slope to the drain boards going toward the sink. Cut from 3/32" stock 1/16" wide strips. ( If you have access to 1/16" half round use that.) Round off the top 2 edges of the 3/32" x 1/16" strips according to diagram B. These are the drain board ridges. I glued 6 of these onto each side of sink. You'll need to clamp these down if you sanded the slope in. Before you glue the sink to the underneath side of the sink top, cut a hole in the center for your drain. I found a plastic cap about 1/4" in diameter. I cut it off at about a 1/4" and stuck a straight pin in the center, painted it silver and dotted it with black on the inside of the cap to simulate the drain holes. This became my sink strainer/basket. Another option is to use a gripper snap for the rim and leave out the strainer/basket. Gripper snaps are found in the notions department of a fabric store. When you are satisfied with all of your sanding, glue the sink to the underneath side of the sink top, and set this assembly aside. Cabinet. 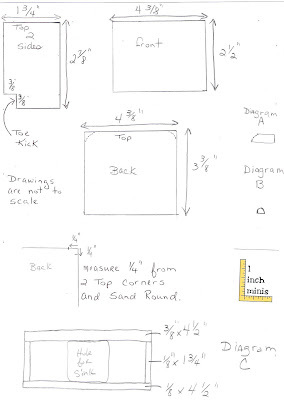 Follow the sizes in the diagram for cutting out the sink sides, back and front. Round off the top 2 corners of the back. Glue the sides onto the back, bottoms even, the back will be 3/8" taller, that's the back splash. Glue the front onto the sides, keep the tops even. Follow the drawing at the top of page. Cut from 1/16" stock a strip 3/8" x 4 3/8", this is to be painted black and will be glued onto the bottom front of the cabinet, it's the back of the toe kick. The doors are made from 1/16" stock, cut 1" x 1 3/4", cut 4. The center vent is 1/16" x 1 1/16" x 1/2", cut 1. With sand paper soften all four edges of the doors, drawers and vent. I cut vent slots with an exacto knife. I've also seen a shape cut out and filled with decorative screen, maybe paper with tiny holes punched into it, or cross stitcher's perforated paper. Glue sink top onto cabinet. The sink top will be longer and wider than the cabinet by just a bit, center the cabinet under the sink top from side to side and it should have extra in the front. I use gesso to smooth everything in, all the seams need to be filled. I paint the whole sink top and let dry. The gesso will sink into the seams, so you will have to paint the gesso on a few times. After you've got everything filled you can sand it all smooth. Remember you want this sink to look like a piece of cast iron with the smooth finish of porcelain. When that's done paint the sink top and cabinet. Paint the doors separately. I used Rustoleum white, it's an oil base enamel, gives a good appliance finish. Paint and sand between coats with fine sandpaper, I will use up to 400 grit to get a good smooth finish. When you are satisfied with the surface, do not sand the last coat of paint. Glue on the doors and toe kick. Go to the Kitchen Room Box Stove for a little more explanation of the painting. I don't make my kitchen cabinets or appliances open. I am not going to open them and I don't leave them hanging open. They aren't hanging open in my full size kitchen. I think leaving them open in a miniature scene emphasizes that it is a miniature. I'm going for as much realism as I can achieve. For the handles I painted a plastic drinking straw silver, then I tried to slice off identical widths, then I cut these in half. I glued the handles on with super glue, be careful. Glue your strainer/basket in. I ordered a faucet from Hobby Builders, #938, $6.99. If you have any questions about this please e-mail me and I will be glad to help you.